Red flowers with antique silver wings decorate our innovative Angel of Death earrings. The skulls are carved from found bone (no animal cruelty involved), the wings are lead- and antimony-free pewter, the flowers are carved and dyed coral, and their bodies are opaque black glass teardrops. These lightweight goth lovelies dangle about 2" from the tops of their surgical steel (plated to match the wings) earring hooks. They're just the things you want to wear for Halloween or Day of the Dead festivities ... and the cost won't be the death of you. 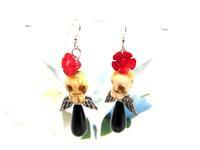 We're famous for affordable spooky jewelry here at SPARKLE PLENTY.